In 1987, two major national associations - Mental Health Corporations of America and National Council for Behavioral Health - joined forces to create an innovative insurance option for community behavioral health, the Mental Health Risk Retention Group (MHRRG). A solid team of experts manage the company, including distinguished attorneys, nationally known actuaries, reinsurance companies and underwriting managers with decades of experience specializing in liability insurance for the behavioral health field. 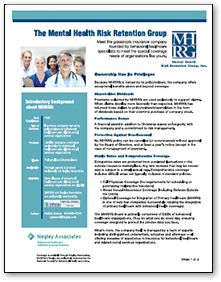 The Mental Health Risk Retention Group, Inc. was formed to provide a stable source of comprehensive liability insurance for mental health organizations and to improve the quality of care through loss prevention program development. To become a shareholder, a minimum of one share at $1,548.75 per share, of Class D MHRRG common stock must be purchased. Dividends have been paid since 1991. To date over $19 million has been paid to our insureds / shareholders. In 2018, a 10% policyholders dividend and a $50 per share dividend were paid to MHRRG insureds.